“The New Normal”, first coined in September 2009 to describe market changes “that may forever change the world”, has become a favorite on Wall Street and in the financial press. It’s quite catchy. Someone should have trademarked it. Beyond its clickbait appeal, though, was it just another example of a haloed Wall Street prognosticator setting unrealistic market expectations? New Normal circa 2009 suggested that the world was about to enter a prolonged period of lower stock market returns. Instead, as has happened before, risk assets, such as stocks, have provided long-term investors with handsome returns. Yes, the prognostications of 2009 were worth little to no weight. Lest you think this characterization is a little too critical, the evidence behind this statement can be found in our recent posts titled “Why I Don’t Make Forecasts” and “Groundhog Day” (click the links to read). 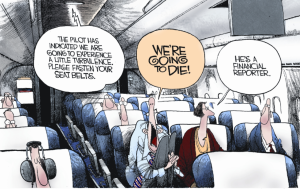 The pieces aren’t long and contain data showing why I’ve never heard a seasoned professional deny – in private – that market predictions are never in doubt, but often wrong. 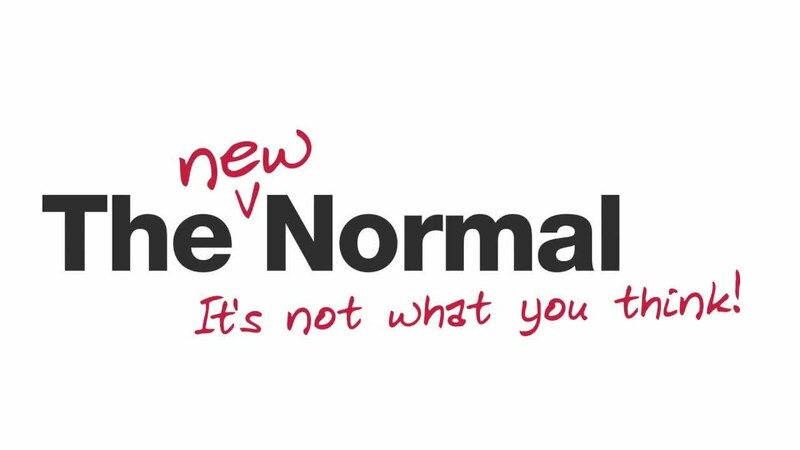 More to the point of the title of this piece, though, the New Normal didn’t bring any new – just the normal. If you are going to invest in the stock market repeat the normal after me. Many sensational headlines have been written the past few weeks about market declines, but two things have increased for sure: the viewership and the ad revenues of financial media organizations (see Michael Ramirez’s again on-point cartoon from 2009 – thanks also to Ben Carlson for helping to recirculate this). I don’t think investing is a game, but the fluctuation Sommer was speaking about is normal. About a week ago, my firm sent out a blast email that included links to “Keep A Steady Hand on the Tiller” and “What To Do Now About…”, the latter of which included the graph below. We received many thank you notes for helping to remind investors that what we were all feeling was indeed normal. Notably, the reminders we sent out were slightly re-worded versions of articles I had written in 2015 and 2016. Yes, concerning market headlines and downturns happen much more often than we think. Source: Schroders Investment Insights. Thomson Reuters Datastream as of February 6, 2018. Data shown for the one-day fall is for S&P 500 over the last 30 years. 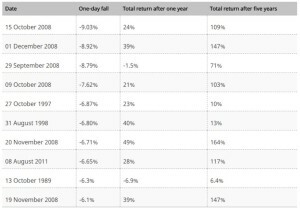 Returns after a one and five-year period are for the total return index, which includes dividend. For information purposes only. Past performance is not a guide to future performance and may not be repeated. 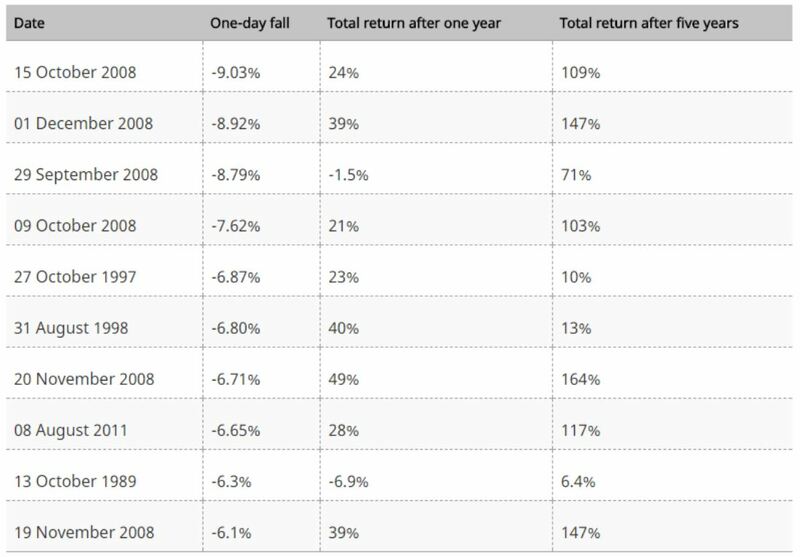 First, notice that even though last week’s 4.6% one-day drop made everyone feel uneasy, it didn’t rank in the top ten one-day drops over the past 30 years. 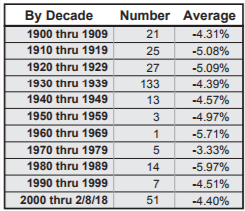 In fact, it didn’t even rank in the top 100 worst days in history, and as the chart below shows, since the year 1900 it was about average. Source: Crandall, Pierce & Company with data from Dow Jones & Company (the full chart can be found here). 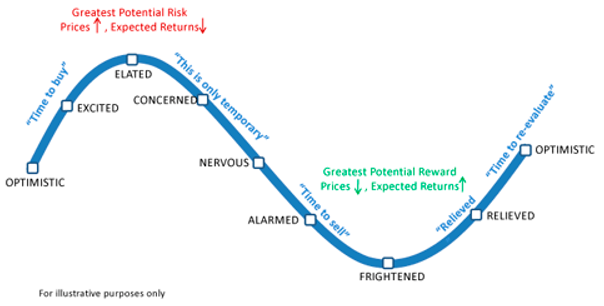 Back to the previous chart, as the Cycle of Emotions illustrated with its Greatest Potential Reward notation, the strongest rebound was a total 5-year return of 164%, which came after one of the worst drops of 6.7%. Normal is the market going up and down in a manner that can be unnerving over short-term periods. And, normal is that true long-term investors are rewarded for not reacting to sensational New Normal headlines.